During the first half of the game, the New England Patriots were having trouble getting information to the tablets. 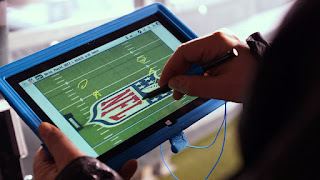 During the game, the tablets aren't allowed to access the real internet but rather are just used to display static pictures of formations so the coaches can analyze how the other team lined up against their team. (Yes, that is their single purpose on the sideline during the games) There are all kinds of rules dictating when they can be used if the other team has problems with their ability to use the tablets but the Broncos were allowed to continue using the tablet on their side of the field. Enter the conspiracy theorists and the idea that since Roger Goodell couldn't slam Tom Brady for deflategate, maybe he conspired with Microsoft to give the Broncos the upper hand in this game. Obviously, this is all false but it is funny to think about since deflategate has been such a bad PR move for the NFL over the last year. You can think of it as the hacker approach. Goodell couldn't get Brady, so he conspired to take him down by limiting a technology that is beneficial to any team in a winner takes all game. Microsoft sort of took one on the chin for the tablets failing during such a important game but in the end, Microsoft is winning more than they lost. Microsoft reps quickly expressed that the point of failure was the network and not the tablets. Before the issue was even fixed (in about 5 minutes of actual game time) Microsoft made the statement that the problem was not with the tablets. The issue did ultimately end up being with network connectivity and not the tablets. Last year TV personalities couldn't get the name correct and now this year, the tablets fail in one of the biggest games. The difference is that last year Microsoft couldn't win because no one knew what they were. This season, the Surface is proudly displayed during every pre-game and postgame commentary and all of the TV personalities got the memo to call them Microsoft Surface tablets. So now regardless of how much actual use the tablets get before and during the games, people actually know what they are called, so call that a win for Microsoft.